The Athletics seem to be receiving more promising news on the pitching front, as Susan Slusser of the San Francisco Chronicle has reported (Twitter links). Southpaw Sean Manaea is said to be “well ahead” of schedule in his effort to return from shoulder surgery. Whether that means there’s real hope he’ll be able to make it back on the MLB mound this season isn’t clear, but it appears that’s at least a possibility given that Manaea is beginning to throw. Meanwhile, youngster James Kaprielian seems to be making a quick recovery from the lat issue that sidelined him at the outset of camp. The last thing anyone wanted to see was another significant health problem for him, so that’s certainly promising news. Tigers righty Chris Smith appears headed for Tommy John surgery, as Evan Woodberry of MLive.com was among those to report on Twitter. It’s dreadful news for a hurler who has only briefly touched the majors but seemed to have a shot at earning a pen spot in Detroit. Smith pitched to a 3.93 ERA with 10.6 K/9 and 3.4 BB/9 last year at the Triple-A level. The Rays will likely go without righty Ian Gibaut to open the season, as Marc Topkin of the Tampa Bay Times tweets. It seems the broader prognosis for his lat injury is a good one, but the club will likely take things slow with the 25-year-old hurler. Gibaut hasn’t yet thrown at the game’s highest level, but has generally torched minor-league hitters throughout his four seasons as a pro. Last year, he worked to a 2.09 ERA with 12.1 K/9 and 3.4 BB/9 over 56 Triple-A frames. Veteran utilityman Sean Rodriguez has a meniscus tear that may require surgery, per Matt Breen of Philly.com (Twitter link). That likely won’t make for a terribly lengthy absence, but obviously knocks out any chance of him breaking camp with the Phillies. Rodriguez could certainly still challenge for a job in Philadelphia or elsewhere after working back to health. White Sox prospect Luis Alexander Basabe has a hamate fracture, as MLB.com’s Scott Merkin recently reported on Twitter. That’ll keep him from full game action for about three months, according to initial estimates. Basabe, 22, isn’t a near-term consideration at the MLB level, so this news won’t have much of an immediate impact. It will slow his start to the season, though, which is unfortunate — particularly since he was looking to bounce back from a tepid showing at Double-A and tough trip through the Arizona Fall League. Yankees general manager Brian Cashman announced to the media Wednesday that outfielder Jacoby Ellsbury won’t be reporting to camp until next month, as he’s currently being slowed by a case of plantar fasciitis (link via Dan Martin of the New York Post). It’s not yet clear whether Ellsbury will be ready for Opening Day, nor is it clear how much playing time would be available to Ellsbury considering a Yankees outfield mix that features Aaron Judge, Aaron Hicks, Brett Gardner and Giancarlo Stanton (with Clint Frazier also looming in the minors). Ellsbury seems poised for a bench role after missing the entire 2018 season due to injury (most notably including hip surgery). The injury news didn’t stop there for the Yanks, either, as right-handed pitching prospect Mike King has been shut down for the next three weeks after an MRI revealed a stress reaction in his right elbow. He’ll be re-evaluated after that three-week down period. The 23-year-old King posted a ridiculous 1.79 ERA with 8.5 K/9 against 1.6 BB/9 in 161 1/3 innings across three levels last season, topping out with a brilliant six-start run in Triple-A Scranton/Wilkes-Barre. In what’s become all too familiar a theme for Angels fans, there’s some early trouble regarding right-handers Nick Tropeano and Alex Meyer. Jeff Fletcher of the Orange County Register reports that Tropeano has only just resumed “light” throwing after suffering a December setback in his rehab from the shoulder woes that derailed much of his 2018 season (Twitter links). Tropeano had three DL stints pertaining to his shoulder in ’18 and was eventually shut down after undergoing a platelet-rich plasma injection. He’s unlikely to be ready for Opening Day, per Fletcher. Meanwhile, Meyer had yet another surgery on his perennially problematic right shoulder — this time an arthroscopic procedure performed in November. He’s not yet been cleared to throw. The former top prospect was a long shot to factor into the pitching staff anyhow given his extremely lengthy injury history. He was cut loose by the Halos earlier this winter but returned on a minor league contract. MLB.com’s Mandy Bell writes that Indians right-hander Danny Salazar is confident he’ll be able to begin throwing off a mound by the end of Spring Training. That doesn’t create much optimism for an early 2019 return, nor does the fact that Bell suggests Salazar could be able to return to the Major League roster “prior to the All-Star break.” Given Cleveland’s strong rotation and the fact that Salazar didn’t even pitch in 2018 due to shoulder troubles that necessitated surgery in July, he’ll be a part of the team’s bullpen picture whenever he does return. With the righty still only playing catch on flat ground, however, it’ll likely be awhile before a more definitive timeline takes shape. An MRI performed on Athletics right-hander James Kaprielian revealed a strained lat muscle, per Susan Slusser of the San Francisco Chronicle (Twitter links). He won’t throw for the next two to three weeks. 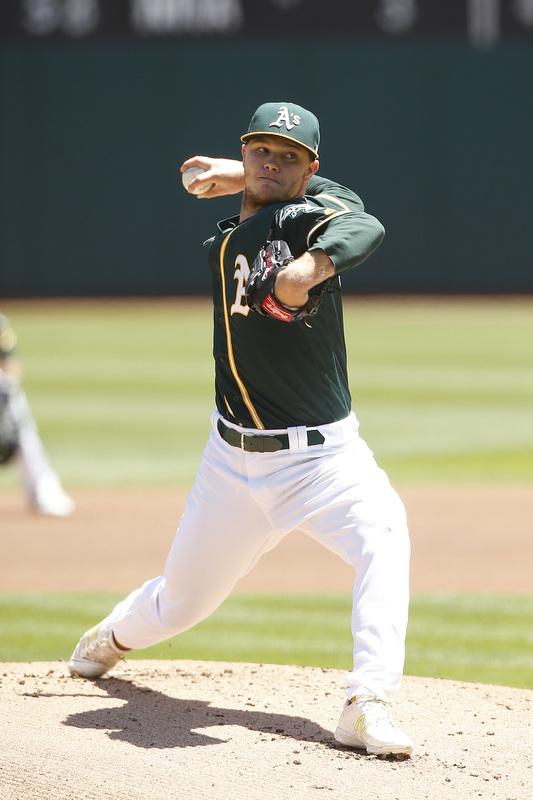 Kaprielian, 25 next month, was once regarded as one of the game’s top pitching prospects and was a key piece acquired in the 2017 trade that sent Sonny Gray to the Bronx, but he hasn’t pitched since 2016 due to 2017 Tommy John surgery and a series of shoulder issues in 2018. Free-agent left-hander Dallas Keuchel asked for a six- to seven-year contract worth $25MM to $30MM per annum at the beginning of the offseason, while fellow ex-Astros teammate and Scott Boras client Marwin Gonzalez sought a deal in the $60MM neighborhood, according to Buster Olney of ESPN. Both Keuchel and Gonzalez remain on the unemployment line, meaning they haven’t landed offers in those ranges, and it’s not surprising in either case if those asking prices are accurate. Entering the offseason, MLBTR predicted an $82MM guarantee for the 32-year-old Keuchel and $36MM for the soon-to-be 30-year-old Gonzalez, who wants a pact similar to the four-year, $56MM accord fellow utilityman Ben Zobrist signed with the Cubs going into the 2016 campaign. Zobrist, however, reached the market as a far more accomplished player than Gonzalez has been to this point. With Wil Myers, Manuel Margot, Hunter Renfroe, Franchy Cordero, Franmil Reyes and Travis Jankowski in the mix, the Padres have a surplus of major league outfielders. However, “it’s looking less likely by the day” they’ll trade any of those players before the season, AJ Cassavell of MLB.com writes. In the event a deal doesn’t come together in the next couple months, the Padres could demote anyone from the group expect for Myers, who’s the only one without a minor league option remaining. Before the Indians signed him to a minor league deal this past Thursday, reliever Alex Wilson “had interest from 10 or 11 different clubs, different minor league options,” he tells Paul Hoynes of cleveland.com. The presences of now-injured shortstop Francisco Lindor and catcher Roberto Perez helped influence Wilson’s decision to sign with the Tribe, the right-hander added. The 32-year-old Wilson spent the past few years with the AL Central rival Tigers, with whom he logged a terrific 3.20 ERA and posted 5.85 K/9 against 2.11 BB/9 over 264 2/3 innings. Athletics righty James Kaprielian suffered a setback in his shoulder and will undergo an MRI, manager Bob Melvin told Jane Lee of MLB.com, Susan Slusser of the San Francisco Chronicle and other reporters Sunday. The severity is unknown, but it’s still a disappointing development for the A’s and the 24-year-old Kaprielian, who hasn’t pitched professionally since 2016 because of shoulder problems. Kaprielian, a first-round pick in 2016, was a key part of the A’s return from the Yankees for Sonny Gray in 2017. Regardless of what happens with Kaprielian, Oakland “would love” to pick up one or two more starters prior to the season, Slusser writes. The low-budget Athletics aren’t looking to spend a lot, per Slusser, but there are a few pitchers on the market who could appeal to them. Free agents Brett Anderson and Edwin Jackson were key members of last year’s playoff-bound A’s starting-staff, for instance, and they have shown interest in the unsigned Gio Gonzalez, an Athletic from 2008-11. Dec. 1, 1:04 PM: Right hander Wilkin Ramos is Pittsburgh’s return in the deal, the teams announced this afternoon. Ramos, 18, spent all of last season at Oakland’s Dominican Summer League affiliate, where he posted an 8.55 K/9 against 3.83 BB/9 over 40 IP. He stands a projectable 6’5, 165, but didn’t rank among the team’s top 30 prospects in recent updates by various outlets. Nov. 20, 6:48 PM: The Athletics announced today that they have acquired righty Tanner Anderson from the Pirates. The Oakland organization has also added four players to its 40-man roster to protect them from the Rule 5 draft: outfielders Luis Barrera and Skye Bolt along with righties Grant Holmes and James Kaprielian. Anderson is a 25-year-old who was originally taken in the 20th round of the 2015 draft. He has steadily marched through the Pittsburgh farm since becoming a professional, working as both a starter and reliever. He shifted to the pen full-time in 2018. Though he hasn’t typically produced exciting strikeout numbers, Anderson limits the free passes and long balls. And he has generally produced outstanding groundball numbers. Indeed, Anderson has yet to finish a season with less than a 60% groundball rate. In the just-completed season,he worked to a 2.64 ERA with 7.2 K/9 and 2.2 BB/9 in 61 1/3 innings. The Yankees pulled off a long-awaited rotation upgrade, acquiring righty Sonny Gray from the Athletics today for three prospects: outfielder Dustin Fowler, infielder/outfielder Jorge Mateo, and righty James Kaprielian. In addition to Gray, the Yankees will receive $1.5MM in international bonus pool money. The teams have officially announced the trade, which was first broken by Jack Curry of the YES Network. Yahoo’s Jeff Passan was first with the return. Gray joins a Yankees rotation that lost Michael Pineda to Tommy John surgery this month, but added Jaime Garcia in a trade with the Twins. With C.C. Sabathia, Masahiro Tanaka, Luis Severino, and Jordan Montgomery also in the mix, the Yankees have a rotation logjam. Yankees manager Joe Girardi nixed the idea of a six-man rotation, so it seems Montgomery will move to the bullpen or to Triple-A, according to Curry. Sabathia and Garcia are headed to free agency after the season, and Tanaka can join them if he chooses to exercise his opt-out clause. Gray adds veteran stability for the 2018 and 2019 seasons. Gray, 27, was drafted 18th overall by the Athletics in 2011 out of Vanderbilt. He excelled from 2013-15, posting a 2.88 ERA over 491 innings. 2016, however, was a lost year for Gray as he endured DL stints for a strained right trapezius as well as a forearm injury. This year, Gray is back on track with a 3.43 ERA in 16 starts, as well as his best strikeout rate since his rookie year. Gray, who is listed at 5’10”, is one of the most successful starting pitchers of this height since the Dead Ball Era, to this point in his career. With the Cubs having acquired Jose Quintana several weeks ago, Gray was the big prize of the 2017 MLB trade deadline. In the end, the Athletics were unable to pry loose the Yankees’ top three prospects: Gleyber Torres, Clint Frazier, and Chance Adams. Fowler, a 22-year-old outfield prospect, suffered a major knee injury in the first inning of his Major League debut last month. The open rupture in his right patella tendon resulted in season-ending surgery. MLB.com ranked Fowler fourth among Yankees prospects, citing a potential five-tool ceiling. Now, Fowler will likely make his first MLB plate appearance in 2018 as a member of the Athletics. Mateo, 22, was ranked eighth among Yankees prospects by MLB.com. Mateo has what Baseball America describes as “80-grade speed,” and this year he’s spent most of his time at center field and shortstop. He was promoted to Double-A in late June, and has flourished with a .300/.381/.525 line in 140 plate appearances. Mateo was the key to the deal for Oakland, according to Susan Slusser of the San Francisco Chronicle. Prior to adding Garcia and Gray to their rotation, the Yankees completed a mid-month blockbuster with the White Sox that brought in David Robertson and Tommy Kahnle for bullpen help and Todd Frazier to contribute at the infield corners. The Yankees hold just a half game lead over the Red Sox for the AL East, with a Wild Card berth a possible alternative. The last-place A’s also shed a pair of bullpen pieces earlier this month, sending Sean Doolittle and Ryan Madson to the Nationals. The Gray trade is another in which they’ve moved veteran pitchers (and their salaries, although Gray’s salary was not a primary factor in this deal) for younger talent. Prized Yankees prospect James Kaprielian is slated to undergo Tommy John surgery next week, per a club announcement. While the news is obviously a disappointment, it was perhaps the anticipated outcome at this stage. Kaprielian, who was taken 16th overall in the 2015 draft, had already missed time with elbow issues early in his career. The former UCLA righty was limited to just 56 frames (including a fall league placement) in his first two seasons as a pro. When he experienced elbow discomfort again this spring, it was determined that the surgery was required. There had been at least some hope that Kaprielian could contribute to the Yanks as soon as this year. Despite his limited action over the past two seasons, he impressed when he was on the hill, compiling an overall 2.89 ERA with 10.0 K/9 and 2.1 BB/9 since joining the organization. Instead, Kaprielian will require a layoff that will likely extend into the beginning of the 2018 season. Though the organization will hope that he’ll progress as a pitcher even as he recovers, that extended delay is hardly a positive development. And while Kaprielian won’t be earning MLB service time during his layoff, his future now faces added uncertainty — though it still retains plenty of promise. Entering the 2017 season, Kaprielian drew strong ratings from most major prospect analysts. Baseball America ranked him fifth in the Yankees organization, while MLB.com placed him just one spot lower on its list. Eric Longenhagen of Fangraphs, who rated Kaprielian fourth among the club’s prospects, wrote that the youngster has an arsenal “approaching [that of] a top-of-the-rotation arm,” while noting that his ability to maintain his velocity and stay healthy remained major points in question. Yankees pitching prospect James Kaprielian is weighing whether or not to undergo surgery, GM Brian Cashman told reporters including Erik Boland of Newsday (Twitter links). Cashman didn’t make clear just what surgical options might be on the table for the 23-year-old, who is said to have experienced elbow pain recently, but all the hints suggest it could be a significant injury. “The rehab process has not been successful,” said Cashman, “so he’s facing some decisions.” Kaprielian also dealt with elbow problems last year, limiting his ability to gain minor-league experience, but there were still suggestions that the 2015 first-rounder might factor at the MLB level this year. The Rangers have provided some updates on several players, all via T.R. Sullivan of MLB.com (links to Twitter). Righty Tyson Ross will need to hold off on his rehab for a bit after experiencing upper back spasms. While it doesn’t appear as if there’s any broader concern, it will slow his timeline by at least a week. Meanwhile, Adrian Beltre’s new calf injury will likely cost him enough time to be measured in weeks rather than days, per assistant GM Mike Daly. Understandably, the club is charting a cautious course with the veteran, who had been nearing his return from calf issues before suffering another strain in a different area of the muscle. Finally, the team will wait to see how setup man Matt Bush responds to an injection before determining whether he’ll need a DL stint for his sore shoulder. Dodgers outfielder Franklin Gutierrez is headed to the 10-day DL with a hamstring strain, as Bill Shaikin of the Los Angeles Times reports (Twitter links). He’ll be replaced for the time being by Trayce Thompson, but skipper Dave Roberts says it’s expected to be only a one-to-three-week layoff. The Angels have placed righty Andrew Bailey on the 10-day DL to rest his inflamed shoulder, per a club announcement. He’ll be replaced on the active roster by fellow righty Daniel Wright. It’s not yet clear just how long Bailey will be down. For Wright, this’ll be his third call-up to the majors; he saw action last year with both the Reds and Angels, working both as a stater and from the pen. The Phillies have been in rebuild mode for some time, but the tide might begin to turn soon, with the team perhaps spending bigger in the free-agent market, GM Matt Klentak tells MLB.com’s Todd Zolecki. “That time is coming,” says Klentak. “I have no question whatsoever that our ownership group will make the necessary investments. … It’s a matter of whether it’s this coming offseason or the following year. It’s not limited to free agency. We could just as easily make an investment in the form of a trade acquiring a big contract.” The Phillies were active this winter, signing Michael Saunders and Joaquin Benoit, trading for Clay Buchholz, Howie Kendrick and Pat Neshek, and extending Jeremy Hellickson a qualifying offer that the righty ended up accepting. It sounds, though, like the team’s additions of talent could get more significant in the near future. Klentak adds that the Phillies could soon begin to see top prospects arrive in the Majors. He doesn’t name them, but top prospects the Phillies currently have at the Triple-A level include J.P. Crawford, Jorge Alfaro, Nick Williams, Roman Quinn and Dylan Cozens. Here’s more from the East divisions. The Yankees are alarmed by righty prospect James Kaprielian’s recent elbow troubles, George A. King III of the New York Post writes. Kaprielian had an MRI this week and will head to Los Angeles to visit Dr. Neil ElAttrache Tuesday. Kaprielian, the Yankees’ first-round pick in 2015, also missed much of last season with a right flexor tendon injury. He has pitched just 29 pro innings thus far in his career, plus 27 in last year’s Arizona Fall League. MLB.com currently ranks him the sixth-best prospect in a very good Yankees system. The Orioles’ recent minor-league signing of Edwin Jackson and acquisitions of Miguel Castro and Andrew Faulkner are part of a broad pattern of the team acquiring inexpensive pitching depth, Dan Connolly of BaltimoreBaseball.com writes. Three pitchers the O’s acquired in minor deals — Gabriel Ynoa (acquired for cash in February), Jayson Aquino (acquired for cash last year) and Chris Lee (acquired for international bonus slots two years ago) — are candidates to start for the team next week. “I know when we first acquired (Jesus) Liranzo or Aquino or Chris (Lee), OK, minor league deal. But guess what? Here we sit. We’ll see,” says manager Buck Showalter. “There’s a long way from where they are now to contributing consistently, but where else are you gonna get them from? We haven’t been fortunate yet in some of the other programs that people are.” Connolly notes that the Orioles haven’t had much recent success with players acquired in the international market, which is one reason they’re supplementing their roster with players acquired in other ways. Despite Mattingly’s dispute with the Yankees, he went on to spend the next four seasons with the club before retiring after the 1995 campaign. The Bombers were the only team for which Mattingly played, of course, in an excellent career that began in 1982. As for the Yankees, although Steinbrenner passed away in 2010, his daughter, part-owner Jennifer Steinbrenner, has kept her father’s rule in place, per Billy Witz of the Times. Many, including River Ave Blues’ Mike Axisa, aren’t happy about it. Trade rumors have connected the Yankees and White Sox ace Jose Quintana over the past few months, but no deal is brewing between the teams, reports Curry (video link). Nothing has changed since January for the Yanks, who were then loath to subtract from their loaded farm system to acquire Quintana and remain unwilling to trade a prospect haul for the left-hander as Opening Day approaches. The Yankees are reportedly willing to listen to offers for utilityman Rob Refsnyder, and with that in mind, Curry notes that he’s going to have a difficult time cracking their 25-man roster. If New York goes with a four-man bench, odds are it’ll be Chris Carter, Austin Romine, Aaron Hicks and Ronald Torreyes who serve as their reserves, says Curry, who points out that Refsnyder does have a minor league option remaining. Thus, it’s not necessarily a must for the Yankees to trade the soon-to-be 26-year-old. Although he missed most of last season with an elbow injury and hasn’t pitched above the High-A level, right-hander James Kaprielian has a chance to end up in the majors sometime this year, according to George A. King III and Ken Davidoff of the New York Post. The 23-year-old, whom the Yankees chose 16th overall pick in the 2015 draft, threw a three-inning simulation game Friday and could make his next appearance in a spring training contest, manager Joe Girardi told King and Davidoff. Girardi believes Kaprielian has “a ton of talent” and will have an opportunity to “move pretty quickly” toward the big leagues if he stays healthy.